A large area of the park which has experienced several forest fires, the most recent in 2003. Seasons to Visit Year-round; free of snow roughly from late May through October. Habitat Montane lodgepole pine/Douglas-fir and Englemann spruce/subalpine fir forests, including significant burned and blowdown areas; avalanche zones, post-glacial landscapes. Viewing Highlights An excellent area to see the results of a large scale wildfire and to view and learn about natural regeneration processes. The Fireweed Loop is a moderately easy 1 km loop trail, with 40 metre elevation gain; interpretive panels at roadside and along trail. Very good for spring and early summer wildflowers. Subalpine birds and other wildlife. Scenic views of mountains from all parts of the valley. Stanley Glacier trail and other moderately difficult trails give access to backcountry areas where more post-glacial and burned landscapes can be seen. Marble Canyon and the Paint Pots are significant features in their own right and are treated individually on other pages. Other Features Monument marking the Continental Divide, the border between BC and Alberta and between Kootenay and Banff National Parks. Main Access Continental Divide monument and Fireweed Loop are on Highway 93 (Kootenay or Banff-Windermere Highway), 9 km west from the junction of Highways 1 and 93 at Castle Mountain, or 94 km east from the highway junction in Radium Hot Springs. National Parks permit is required for all vehicles stopping here. Secondary Accesses Large burned areas are easily seen from the highway for several kilometres west of Vermilion Pass. Use caution when stopping and pull well off the highway. Cautions Be aware of bears and cougars; do not disturb any wildlife. Trails other than the Fireweed Loop are moderately difficult to strenuous and are in a mostly lightly travelled wildland area; you need to be in good physical condition and be properly equipped with good hiking footwear, rain gear, food and water. Water is available from creeks and lakes but should be boiled or treated. There is no mobile phone service in this area. Pay phones are at Castle Mountain Lodge or in Radium Hot Springs village. Regulations No camping or fires except in designated sites. Dogs on leash. All services in Radium Hot Springs, 94 km west, or Banff, 40 km east. Tokumm Creek cuts through beds of limestone creating a spectacular canyon; the 2003 Vermilion Pass fire created many open views. Area/ Trail Length Trail length 1 km one way. Habitat Montane lodgepole pine/Douglas-fir and Englemann spruce/subalpine fir forest with burned and blowdown areas; riparian. Viewing Highlights An excellent location to see post-glacial and water erosional features, as well as the results of a large scale wildfire. A moderately easy (with stairs) trail with interpretive panels. American Dippers use the river year-round and raptors and woodpeckers can be seen in the open areas above; other subalpine birds and other wildlife. Other Features Marble Canyon campground is across the highway and just east of the trailhead. Main Access On Highway 93 (Kootenay or Banff-Windermere Highway) 16 km west from the junction of Highways 1 and 93 at Castle Mountain, or 87 km east from the highway junction in Radium Hot Springs. National Parks permit is required for all vehicles stopping here. This trail has little shade and can be very hot in summer. Trails other than the interpretive trail to the top of the canyon and the trail to the Paint Pots are moderately difficult to strenuous and are in a lightly travelled wildland area; you need to be in good physical condition and be properly equipped with good hiking footwear, rain gear, food and water. Water is available from creeks but should be boiled or treated. Jurisdiction National Parks of Canada. Regulations No camping or fires except in designated areas. Dogs on leash. Facilities Pit toilets at trailhead. All services in Radium Hot Springs, 87 km west, or Banff, 47 km east. Other Recreational Activities Rock climbing; snowshoeing and cross-country skiing in winter. Other Connections A moderately easy trail runs 3.4 km west to the Paint Pots; Tokumm Creek trail is a strenuous overnight backpacking trip to Kaufmann Lake or the Fay Hut. 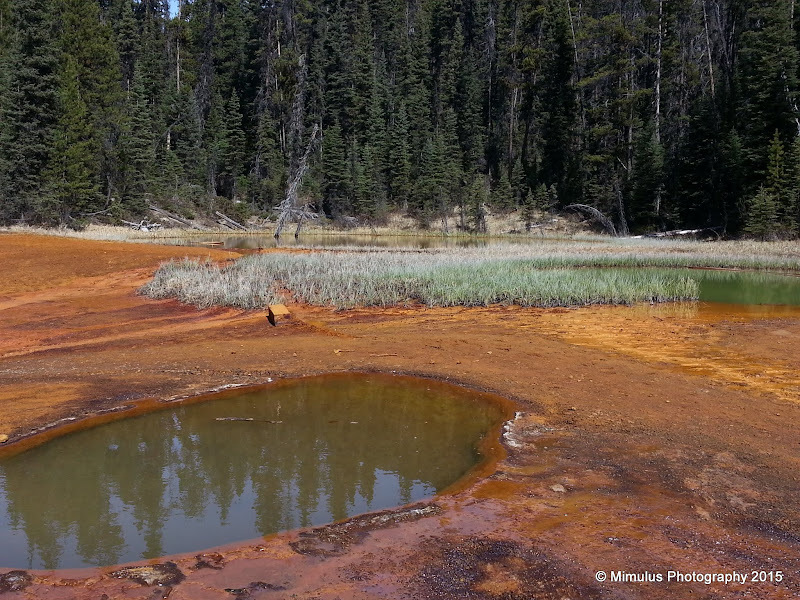 A large complex of cold mineral springs in a deposit of ochre clay. Viewing Highlights A large deposit of ochre: wet clay, coloured by natural hydrated iron oxide pigments. The ochre was used as pigments by First Nations, and a small mining operation took place here in the early 20th century; several mining implements are on display in situ. An easy trail leads to the ochre beds, with a short incline further to the three mineral pools. Spring and early summer wildflowers. Forest birds and other wildlife. Scenic views of mountains . Main Access On Highway 93 (Kootenay or Banff-Windermere Highway) 18.5 km west from the junction of Highways 1 and 93 at Castle Mountain, or 84.5 km east from the highway junction in Radium Hot Springs. National Parks permit is required for all vehicles stopping here. Trails beyond the interpretive trail to the mineral pools and the trail to Marble Canyon are moderately difficult to strenuous and are in a lightly travelled wildland area; you need to be in good physical condition and be properly equipped with good hiking footwear, rain gear, food and water. Water is available from creeks but should be boiled or treated. Please do not disturb or remove the mining implements; they are heritage artifacts. Other Recreational Activities Snowshoeing and cross-country skiing in winter. Other Connections A moderately easy trail runs 3.4 km east to Marble Canyon. The Helmet Creek and Tumbling Creek trails, part of the extended Rockwall backpacking trip, also begin here. A trail leads from Radium Hot Springs village to Redstreak campground, with an area undergoing natural restoration. Area/ Trail Length 2.6 km from visitor centre to campground. Habitat Ponderosa pine, Douglas-fir and juniper parkland. Viewing Highlights A moderate easy trail leads from town to the campground through ponderosa pine grasslands; excellent views west to the Columbia River valley and the Purcell Mountains to the west. Redstreak Restoration Area adjoins the campground; the area has undergone prescribed burning to assist in regeneration of the grasslands associated with the ponderosa pine ecosystem. Forest and grassland birds . Bighorn sheep are commonly seen here on and alongside the road. Restoration Area can be accessed from a trailhead just past the campground kiosk, 2.6 km from the visitor centre. National Parks permit is required for all vehicles stopping here. Please do not disturb campground employees or guests. Wood ticks are common here and especially active in spring and early summer; check yourself over thoroughly after visiting. Facilities Pit toilets at the 1.3 km trailhead and at Restoration Area trailhead. All services in Radium Hot Springs village. Seasons to Visit Year round; birding best in spring and early summer. Habitat Lakeshore with pebbled and sandy beach, marsh. Viewing Highlights Boardwalk for viewing marsh birds, raptors and other wildlife. Views south on lake; Rocky Mountains to east and Purcells to west. Main Access From Highways 93/95, west on Athalmer Road 2.1 km to Third Street, then south 0.4 km to park entrance. Cautions Be aware of bears and cougars. Stay off the railway tracks on the western edge of the park. Regulations No camping or fires. Dogs on leash and not allowed in beach areas. Facilities Picnic tables and flush toilets. All services in Invermere. Other Recreational Activities Swimming, canoeing, kayaking. A large complex of wetlands lakes including and adjoining the Columbia River, from north of Golden to Canal Flats; this page mainly refers to the reach south of Golden to north of Radium Hot Springs. Area/ Trail Length Wetlands area over 15,000 hectares, 150 km long, 1-2 km wide. Much is unprotected or developed. Habitat Marsh, swamp, riparian, fields. Viewing Highlights A site of international significance for migratory and breeding marsh and forest birds, waterfowl, raptors and other wildlife; listed as a WIldlife Management Area in 1996 and as a Ramsar site in 2005 . Over 250 species of bird and 50 species of mammal use the area; the second largest population of Great Blue Herons in western Canada is resident here, and as many as 20,000 waterfowl have been counted in a single day. Views of Rocky Mountains to east and Purcells to west. Parson River Road: from Golden, 33 km south on Highway 95 from the bridge by the railyards at the south end of town; from Radium Hot Springs, 68 north of the junction of Highways 93/95. The first 2 km of this road provides good viewing of the wetlands but please keep to the road. Wilmer Wildlife Area: from Athalmer Road in Invermere, north on Panorama Drive, Wilmer Road to Wilmer, then Maud Road, Main Street and Westside Road. 6.9 km from Invermere there is a pullout on the right; a trail leads to bluffs high above the wetlands. The last stretch is good gravel road but use caution. Secondary Accesses There are a number of locations where the wetlands can be viewed from the highway to the east and gravel roads to the west; use caution when stopping and pull well off the road. Please respect all private property and closed areas. Regulations No camping or fires. No dogs. Facilities None. All services in Golden, Radium and Invermere. Other Recreational Activities Canoeing, kayaking. A small lake with wetlands on the southern edge of Golden. Geographical Description Columbia River lowlands. Seasons to Visit Birding best in spring to early autumn. Viewing Highlights An excellent site for viewing migratory and breeding marsh birds, waterfowl and raptors. One of the few recorded nesting sites in B.C. for Forster’s Tern. Viewing platform with interpretive panels. Views of Purcell Mountains and Columbia Wetlands to west. Main Access On Highway 95 just south of the bridge by the railyards at the south end of Golden, turn east on Reflection Lake Road then right into the parking area. Secondary Accesses The wetlands can be viewed from other locations further along Reflection Lake Road or Highway 95; use caution when stopping and pull well off the road. Facilities None. All services in Golden. Other Connections Hiking trail to Mount 7 (very strenuous) begins here. A busy park featuring a large shallow lake with wetlands and open forest and grasslands. Geographical Description Kootenay River lowlands. Area/ Trail Length Park area 144 hectares. Seasons to Visit Year round; birding best in spring and early summer. Campground open May to October; gates may be locked in off-season. Habitat Lakeshore with sandy beach, marsh, bunchgrass, ponderosa pine parkland. Viewing Highlights Marsh at south end of lake is best for viewing waterfowl and marsh birds (private land - please keep to roadside), but birds and other wildlife can be seen throughout the park. A network of easy trails gives good access to the lake and surrounding area. The Forest and Rainshadow trail is a moderately strenuous 2.7 km loop trail which explores grassland, parkland and burned forest habitats. Popular campground in ponderosa pines. Sandy beach, busy in summer. Main Access North access via Wasa Park Road, from Highways 93/95 2.6 km south of junction with Highway 95A. South access 2.6 km further south, or 18 km north of the junction of Highway 93/95 with Fort Steele-Wardner Road. Please respect all private property, including the privacy of campground users. Jurisdiction BC Parks, private land. Regulations No camping or fires except in designated sites. Dogs on leash and not allowed in beach areas. Facilities Picnic tables and flush toilets. Basic services in Wasa village; all services in Cranbrook, 35 km south. A large fish hatchery which specialises in rare white sturgeon, in addition to several species of salmonids. Seasons to Visit Year-round; guided tours available May through August. Habitat Riparian, natural and artificial ponds. Viewing Highlights Rainbow, cutthroat and brook trout, Kokanee salmon and white sturgeon (red-listed on the Species at Risk Act) are hatched and reared here to stock numerous lakes in the southern interior and to supply other hatcheries. Viewing platforms and walking trails. Educational, interpretive and conservation programmes. Main Access 4522 Fenwick Road; 24 km east of Highway 93/95 on Wardner-Fort Steele Road or 6.5 km west of Highway 93. Cautions Watch for bears and cougars. Mobile phone service is not reliable in this area. Jurisdiction Freshwater Fisheries Society of BC. Facilities Basic services in Fort Steele; all services in Cranbrook. 42 km west. A popular hiking area of subalpine and alpine meadows. Habitat Interior cedar-hemlock and Englemann spruce-subalpine fir forest, western larch, subalpine and alpine meadows. Viewing Highlights A network of moderate to strenuous alpine trails through forests, meadows and high ridges of Mount Fernie and the Lizard Range. Forest and alpine birds and plants. Interpretive signs and educational and conservation programmes. Other Features Commercial guided walks and hikes are available through Island Lake Lodge. Main Access Island Lake Lodge is 9.3 km on Mount Fernie Park Road. west from Highway 3 on the south approach to Fernie. These trails range from moderately easy to strenuous, and are in a lightly travelled wildland area; you need to be in good physical condition and be properly equipped with good hiking footwear, rain gear, food and water. Please respect the privacy of lodge guests and property. Jurisdiction Crown and private land. Facilities None. All services in Fernie. A large forested area on the edge of Cranbrook, managed for interpretive and recreational activities. Area/ Trail Length 2000 hectares. Seasons to Visit Year-round; birding and botanising best in spring through early autumn. Habitat Interior Douglas-fir forest, grassland, lakes, riparian. Viewing Highlights A network of easy to moderate hiking trails . Main Access Sylvan Lake access: via Stahl Road at north end of Cranbrook, from Highway 3 at 30th Avenue North. This road is closed to vehicles from November through May. From Second Street South / Baker Mountain Road east of Cranbrook Golf Course . Please respect all private property. Facilities Picnic tables and pit toilets at Sylvan, Alkali and Kettle Lakes. All services in Cranbrook. Other Recreational Activities Mountain biking, cross-country skiing, snowshoeing. A small semi-artificial lake (dammed as a mill pond for log sorting) surrounded by forest and grasslands. Geographical Description Kootenay River Lowlands / Rocky Mountains. Seasons to Visit Spring through autumn. Habitat Lakeshore, riparian, marsh, bunchgrass, rabbitbrush, ponderosa pine/Douglas-fir parkland. Viewing Highlights Birding in woods, on lakeshore and in grassy hills and cliffs above lake. The fields along the access road are also good for grassland birds. Recreation site campground in ponderosa pines, on the site of an old sawmill. Main Access From Lakit Road, 17.5 km south on Highways 93/95 from the junction with Highway 95A, then east 0.8 km on Lakit Road, right 0.8 km on Holmes Road, then left to Lakit Lake Forest Service Road. Or from Fort Steele, 1.7 km north of the junction of Highway 93/95 with Fort Steele-Wardner Road, then north on Holmes Road 5.3 km to Lakit Lake Forest Service Road. Then from either of the above, 3.8 km further to Lakit Lake Recreation Site on gravel road; road has potholes and washboard sections but is good for all vehicles. Please respect all private property along roadside. Note that this site is not to be confused with the longer hike to Lakit Lookout, and that trail can not be accessed from here. Regulations No camping or fires except in designated sites. Facilities Picnic tables and pit toilets. Basic services in Wasa and Fort Steele; all services in Cranbrook. Other Recreational Activities Canoeing, fishing, horseback riding, mountain biking, rock climbing. A large natural forested area in the hills on the edge of Kimberley. Seasons to Visit Year-round; birding and botany best spring through autumn. Habitat Interior cedar-hemlock, Englemann spruce/subalpine fir and Douglas-fir forests, ponderosa pine and bunchgrass parkland, montane and subalpine lakes and wetlands, riparian. Viewing Highlights Birding in woods and wetlands. A network of over 100 km of trails, ranging from easy to strenuous. A good place to observe geological and post-glacial features. Note that parking may be restricted, especially at entrances in residential areas. Most trails are moderately difficult to strenuous; you need to be in good physical condition and be properly equipped with good hiking footwear, rain gear, food and water. Many trails are used by mountain bikers; use caution and give way to riders, especially downhill. Regulations No camping or fires. Facilities None. All services in town. Other Recreational Activities Cross-country skiing and snowshoeing in winter, horseback riding, mountain biking. A large shallow marshy lake on the southern edge of Cranbrook. Area/ Trail Length Elizabeth Lake Bird Sanctuary 249 hectares. Seasons to Visit Birding best in spring through early autumn. Viewing Highlights The prime birding wetlands area in the region, especially for waterfowl, raptors and marsh birds. Interpretive signs and viewing platforms. Secondary Accesses Walk in from east side of lake near corner of First Avenue and 15th Street South, Innes Street and 11th Street South, or on the north side along Wattsville Road. Use discretion when parking. Cautions Please respect all private property. Jurisdiction The Land Conservancy of BC, City of Cranbrook. Facilities Flush toilets in visitor centre. All services in Cranbrook. 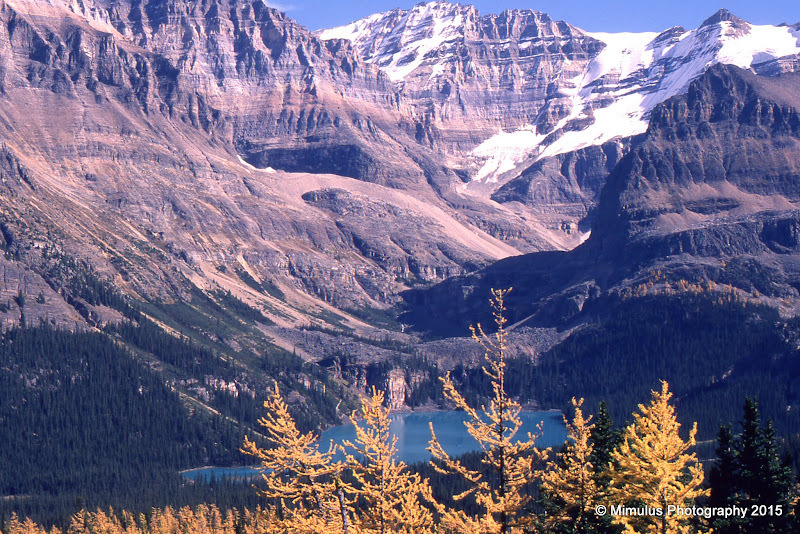 A mountain wildland area contiguous with Waterton Lakes National Park in Alberta and Glacier National Park in Montana, in the “Crown of the Continent” UNESCO World Heritage Site . Seasons to Visit June through September-October, depending on snow. Habitat Interior Douglas-fir/lodgepole pin and Englemann spruce/subalpine fir forest, western larch, subalpine and alpine meadows, alpine tundra. Viewing Highlights A network of moderate to very strenuous alpine trails through forests, meadows and high ridges. Forest and alpine birds and plants, including rare plants found nowhere else in BC. 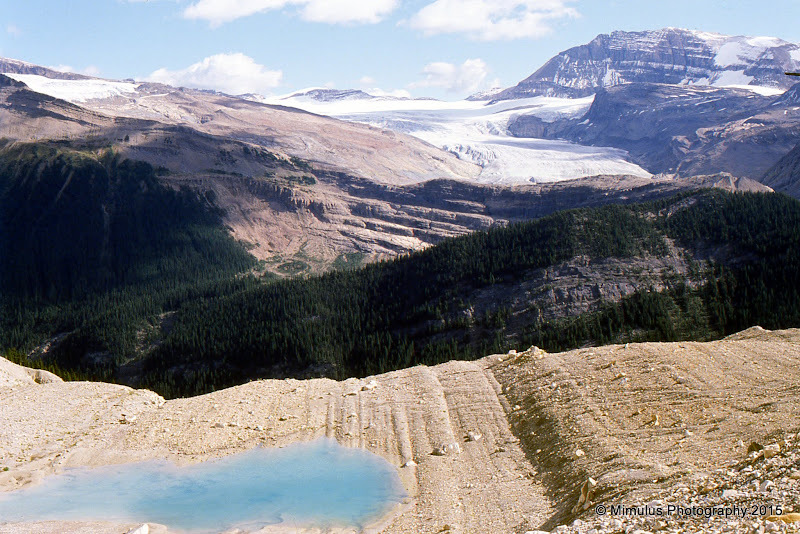 Unique geological features, including a rare unglaciated area and the oldest exposed rock formations (1.3 billion years old) in the Canadian Rockies. Other Features Backcountry campsite at Akamina Creek, 0.9 km west of Akamina Pass and 2.3 km from the trailhead. Main Access Wall Lake and Forum Lake are accessed via the moderately strenuous Akamina Pass trail from Akamina Parkway in Waterton Lakes National Park (Alberta), 15.3 km from the Waterton Park Visitor Centre. Parks Canada permit required for all vehicles. Secondary Accesses On the BC side, a network of logging and mine roads leads into the area from Grasmere, Fernie and Sparwood. These are very long approaches on rough four-wheel drive roads; inquire locally for road conditions. These trails range from moderate to strenuous, and are in a lightly travelled wildland area; you need to be in good physical condition and be properly equipped with good hiking footwear, rain gear, food and water. Akamina Ridge is a particularly steep and exposed rocky scramble with no trail. There is no mobile phone service in this area. Jurisdiction BC Parks, Parks Canada. Regulations No camping or fires except in designated areas. Dogs are discouraged and must be on leash. Facilities Pit toilets at campground and at Wall Lake. Basic services in Waterton Park townsite; all services in Pincher Creek. 60 km north from the townsite, or Cardston, 55 km east. Other Recreational Activities Mountain biking, horseback riding, cross-country skiing, snowshoeing. 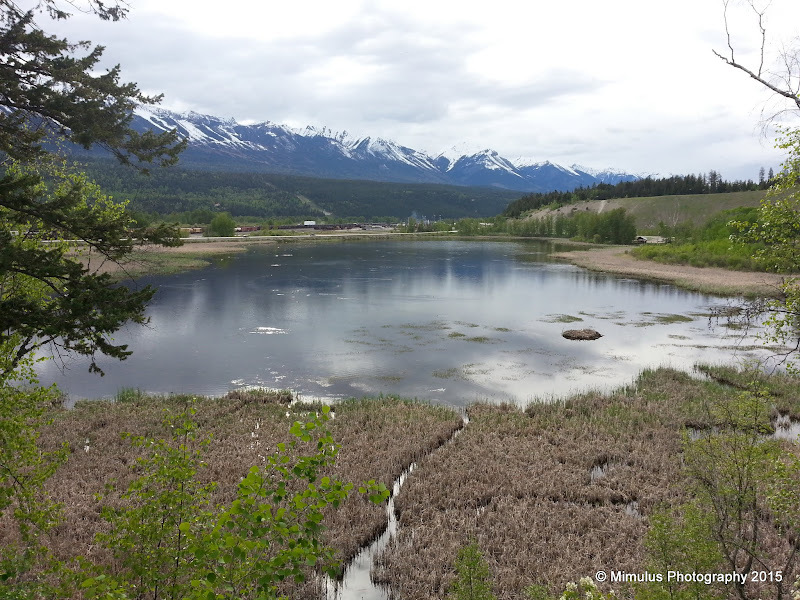 A large expanse of wetlands at the southern end of Kootenay Lake. Area/ Trail Length Creston Valley Wildlife Management Area covers approximately 7000 hectares with 32 km of trails to explore. Seasons to Visit Year-round; birding best in spring through early autumn. Habitat Lakeshore, marsh, fields, riparian, mixed forest. Viewing Highlights A significant mosaic of wetlands, notably for waterfowl such as Northern Pintail and Western Grebes, marsh birds such as Sora rails, migrant songbirds such as Yellow Warbler, and raptors such as Northern Harrier. The Wildlife Interpretation Centre is the main attraction of the area, with a network of easy trails and boardwalks giving good access to the wetlands and surrounding area, with viewing platforms, interpretive displays, signs and programmes. Duck Lake is at the north end of the WMA and is a prime location to enjoy the spectacle of spring and autumn waterfowl migration when tens of thousands of birds congregate. Main Access Wildlife Interpretation Centre is 1 km south on West Creston Road, 11 km west of Creston on Highway 3 or 8.2 km west of the junction of Highways 3 and 3A. Note that the centre is proposed to be replaced as of this writing (early 2016) at a different location, time frame unknown. Secondary Accesses Duck Lake is accessed from Lower Wynndel Road; go north 7.6 km on Highway 3A from the junction with Highway 3, then 1.3 km west on Duck Lake Road to Channel Road. Channel Road runs 7 km along the shore of the lake, the last 3 km on an open and exposed causeway. These are good and flat gravel roads but may be muddy in wet weather. Note that Channel Road is not part of the CVWMA and is subject to closure to vehicles at certain times of the year. Dykes and wetlands may be accessed from several other spots but vehicle access and parking may be restricted. Avoid parking at the access gate on Channel Road – vehicles there may be towed. Jurisdiction Crown Land, Environment Canada. Regulations No camping or fires except in designated areas. No dogs. Basic services in hamlet of Wynndel, all services in Creston. Other Recreational Activities Canoeing and kayaking, cycling. Publications Creston Valley Birds – Where and When to Find Them; available at the Wildlife Interpretation Centre, Creston Chamber of Commerce, and Black Bear Books. A small estuary where Crawford Creek empties into Kootenay Lake. Habitat Rocky beach, marsh, riparian, mixed forest. Viewing Highlights Good for waterfowl, raptors, marsh birds and migrants. Trout and kokanee can be seen spawning in creek. Main Access A rough but level road runs south to the beach from Highway 3A, next to an airfield 6.2 km east of the Kootenay Bay ferry terminal. Secondary Accesses The wetland can be viewed from a pullout on the west side of the highway, 0.6 km east of the bridge. Use caution when parking and pulling out. Use caution in the beach area and on banks of creek. Facilities None. Basic services in Crawford Bay and at ferry, all services in Creston, 75 km south and Nelson, 48 km west via ferry. Other Recreational Activities Canoeing and kayaking. A popular park on an alluvial plain where Kokanee Creek flows into the West Arm of Kootenay Lake. Area/ Trail Length Park area 260 hectares. Seasons to Visit Year-round; birding best in spring through early autumn, fish spawning August through November. Campgrounds open May through September. Habitat Sandy beach, marsh, riparian, interior cedar/hemlock, mixed forest. Viewing Highlights Waterfowl, raptors, marsh and forest birds. A major destination to see trout and kokanee salmon spawning in natural and artificial channels. Forest, marsh and beach plants. Visitor centre with interpretive displays and programmes. 9.5 km of moderately easy trails in woods and along creek and lakeshore. Main Access Main entrance is on the south side of Highway 3A just east of Kokanee Creek, 17.8 km east of the orange bridge on the east edge of Nelson or 12.2 km west of the Balfour ferry terminal. Secondary Accesses Redfish campround and the group camping area area are accessed on the west side of Kokanee Creek, 0.5 km west of the main entrance. No day parking. Cautions Please respect the privacy of campers and all private property adjoining the park. Poison ivy is present here. Watch for bears and cougars. Use caution on banks of the creek and in the beach area; winds on the lake and currents are unpredictable. Regulations No camping or fires except in designated sites. Dogs must be on leash and are not permitted in beach areas except the designated dog beach. Facilities Three campgrounds: Sandspit is a large site on the south side of the highway near the lake; Redfish is a smaller one on the north side, and Friends next to the day use area offers RV sites with hookups . Day use area at beach with picnic tables, pit toilets, changerooms and playground. Basic services nearby on highway and at Balfour; all services in Nelson. Other Connections Kokanee Glacier Provincial Park is an alpine backcountry area, accessed by a 16 km gravel road north of here. Four wheel drive is recommended. 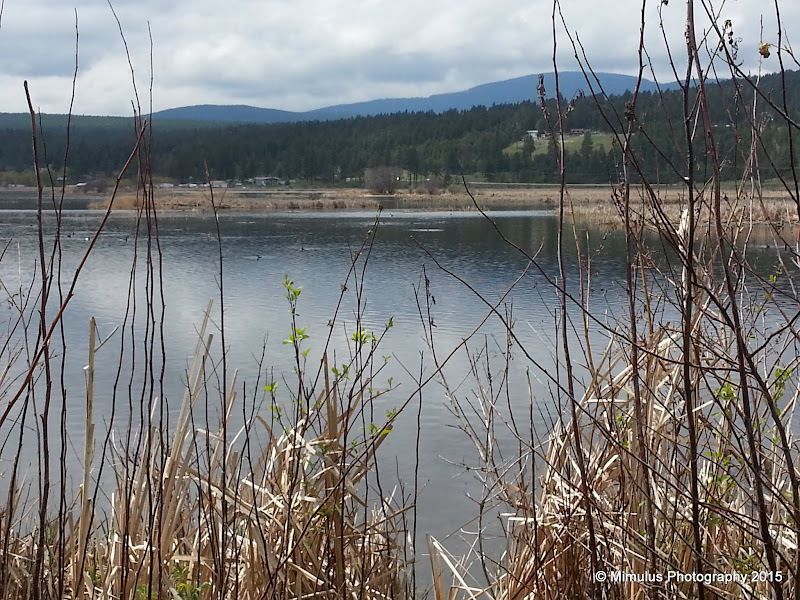 A small mostly wooded park between Highway 3A and the Kootenay River. Habitat Marsh, riparian, interior Douglas-fir, vine maple, mixed forest. Viewing Highlights Waterfowl, marsh and forest birds. Two short trails: moderately steep west trail leads to viewpoint above Kootenay River; easier east trail loops through woods and past marsh. Main Access On north side of Highway 3A, 6.1 km west of the junction with Highway 6 on the west edge of Nelson. Cautions The road continuing from the parking lot to the sewage treatment plant is off limits to the public. Stay off the railway tracks and use caution on banks of the river. Regulations No camping or fires. Dogs must be on leash. Facilities Picnic tables and port-a-potty at parking lot. All services in Nelson. Estuary of the Lardeau River at the north end of Kootenay Lake. Seasons to Visit Birding best in spring through early autumn, fish spawning August through November. Habitat Marsh, riparian, interior cedar/hemlock and mixed forest, fields. Viewing Highlights A significant stopover site for migrating waterfowl, raptors, marsh and forest birds. Trout and kokanee salmon spawning in river and spawning channels. Main Access West side of Kootenay Lake: on the east side of Highway 31, 33.3 km north of the junction with Highway 31A in Kaslo, there is a pullout with a gate and an access road with a sign for Duncan-Lardeau Wildlife Management Area (sign is not easily seen from highway). Please do not block the gate. East side of Kootenay Lake: 33.7 km from Kaslo, go east 1.2 km on Argenta (Duncan Lake) Road, then south on Argenta Road South for up to 5 km. There are several spaces to pull out but a large marsh 3.5 km from the highway is particularly good. This is a good gravel road, which is lightly travelled but watch for traffic, especially logging trucks. Secondary Accesses The flats can also be viewed from a highway pullout 30 km north of Kaslo, or from the bridge over the Lardeau River on Argenta (Duncan Lake) Road. Cautions Please respect all private property adjoining the area. Use caution when parking or pulling out on the roads. Facilities None. Basic services at hamlets of Lardeau and Meadow Creek (gas not reliable); all services in Kaslo or in Revelstoke, 165 km north via Galena Bay ferry. A complex of artificial spawning channels for salmonids. Seasons to Visit Spawning August through October. Note that due to bear activity the best time to visit is mid-day. Habitat Riparian, interior cedar/hemlock, mixed forest. Viewing Highlights A good place to observe trout and kokanee salmon spawning in creek and channels. Birds and other wildlife can be seen in the area. Main Access West from the hamlet of Meadow Creek, on Highway 31, 39 km north of the junction with Highway 31A in Kaslo or 41 km south from the bridge at the south end of Trout Lake. At 2.8 km bear left onto Fish Hatchery Road, then left again after crossing a small bridge. During certain hours you can drive the loop around the channels; otherwise the road can be walked. Bears (black and grizzly) are also interested in the fish; staying in vehicle is recommended in spawning season, and use caution at all times. Facilities Pit toilets. Basic services at Meadow Creek (gas not reliable); all services in Kaslo or in Revelstoke, 155 km north via Galena Bay ferry. Other Connections Meadow Mountain is a superb alpine area just west of here, accessed by a long drive on logging and mining roads; high clearance four wheel drive recommended. The Lardeau River at the outflow of Trout Lake; site of an abandoned town but now just a rough campground and a site for viewing spawning fish. Seasons to Visit Birding spring through early autumn; Gerrard rainbow trout spawning April and May, other salmonids August through October. Viewing Highlights A good place to observe trout and kokanee salmon spawning in river. Notable is the Gerrard or Kamloops strain of rainbow trout, the largest in the world, which are endemic to the Kootenay Lake watershed. Interpretive signs and viewing platform. Main Access On Highway 31, 41 km north from the hamlet of Meadow Creek, or 52 km south of the ferry terminal at Galena Bay. NOTE: despite its designation as a Provincial Highway, most of Highway 31 between Galena Bay and Meadow Creek is unpaved gravel. From Gerrard to Meadow Creek it’s mostly level and wide, but the stretch alongside Trout Lake includes several steep and winding sections. It can be driven by all vehicles but use caution and especially watch for logging trucks. Secondary Accesses The river can also be observed at several points along Highway 31 between Gerrard and Meadow Creek, notably where the highway crosses the river at midpoint. Cautions Please respect all private property in the area. Use caution on the banks of the river. Bears (black and grizzly) are also interested in the fish; use caution at all times but especially in spawning season. Regulations No camping or fires except in designated sites. Dogs must be on leash. Facilities Rustic campground on west side of bridge. Basic services at Meadow Creek or Trout Lake village (gas not reliable); all services in Kaslo, 82 km south, or in Revelstoke, 115 km north via Galena Bay ferry. A popular park on the shore of the Upper Arrow Lake reach of the Columbia River; site of an abandoned homestead. Area/ Trail Length Park size 318 hectares. Seasons to Visit Birding and botanizing spring through early autumn; campground open May through September. Habitat Riparian, lakeshore, grassy meadows, interior cedar/hemlock and mixed forest. Viewing Highlights Forest birds and other wildlife can be seen in the area. Botanizing in woods and meadows. Sutherland Falls is a short easy hike . Main Access On Highway 23, 23 km south from the junction with Highway 1 west of Revelstoke, or 25 km north of the ferry terminal at Shelter Bay. Cautions There is no mobile phone service in this area. Use caution on the banks of the creek and the lakeshore. Bears and cougars are rarelly seen but be watchful. There is poison ivy here. Day use area with picnic tables and pit toilets . Other Recreational Activities Canoeing, kayaking, swimming. FMI West Kootenay Park Management Inc. Relatively easy access to spectacular alpine meadows. Seasons to Visit June through September, depending on snow cover. Habitat Englemann spruce/subalpine fir forest, alpine meadows. Viewing Highlights A moderate trail with a hike of 2 km each way with an elevation gain of 160 metres leads to excellent alpine wildflower meadows with scenic views. Forest and mountain birds and other wildlife . Other Features Sandon is an old mining town with a number of interesting old buildings and mining features, some in poor condition but some undergoing restoration. An unusual sight is several old Vancouver trolley buses. Main Access From the town of Sandon; on Highway 31A 8.5 km east from Highway 6 in New Denver or 38 km west from Highway 31 in Kaslo. Then 6 km south to Idaho Peak Road, and then approximately 17 km to the trailhead. Inquire locally regarding the condition of Idaho Peak Road as conditions vary from time to time. Four wheel drive recommended. Cautions This is a wilderness area with no facilities. Hikers should be in good physical condition with proper equipment, food and water. Bears and cougars are rarely seen but be watchful. Facilities None. Basic services in Sandon, all services in New Denver and Kaslo. Other Recreational Activities Mountain biking. Expansive subalpine and alpine meadows and ridges. Access by moderately easy to strenuous day hiking or backpacking. Area/ Trail Length Park area 260 square kilometres with total 65 km of hiking trails. Seasons to Visit June through October; road not open or cleared in winter. Habitat Interior cedar-hemlock and Englemann spruce-subalpine fir forests, subalpine meadows and wetlands. Viewing Highlights Several hiking trails of various levels of difficulty; Upper Summit trail is a moderately easy 1 km from parking area to subalpine meadows. Excellent wildflower meadows in summer. Several viewpoints and interpretive signs on the Meadows in the Sky Parkway which winds up up the mountain, and on summit area trails. Scenic views of Selkirk and Monashee Mountains and Illecillewaet River valley. Main Access From the junction of Highway 1 and Highway 23 north in Revelstoke, 0.9 km east on Highway 1 to Meadows in the Sky Parkway. Then 25 km to the trailhead at Balsam Lake. This road is paved but is steep, narrow and winding with many switchbacks and not suitable for large vehicles or trailers. National Parks permit is required for all vehicles on this road, and it is closed to uphill traffic at 1730 daily. A shuttle bus runs between Balsam Lake and Heather Lake near the summit. These trails range from moderately easy to strenuous, and are in a lightly travelled wildland area; you need to be in good physical condition and be properly equipped with good hiking footwear, rain gear, food and water. Water is available from creeks but should be boiled or treated. There is limited cell phone service in this area. Regulations No camping except in designated backcountry sites at Eva Lake and Upper Jade Lake. No fires. Dogs on leash. Facilities Picnic tables and pit toilets at Balsam Lake. All services in Revelstoke. Other Recreational Activities Snowshoeing and cross-country skiing in winter. Caribou Cabin at km19 on the Parkway is open in winter for overnight use. Expansive subalpine and alpine meadows and ridges. Access by moderate level backpacking or day hiking. Seasons to Visit June through October depending on snow. Snowmobile area in winter. Habitat Englemann spruce-subalpine fir forest, subalpine meadows, alpine tundra. Viewing Highlights Moderate hiking trail reaches open meadows within 3 km. Subalpine birds and other wildlife including caribou. Scenic views of Selkirk and Monashee Mountains and Columbia River valley. Other Features Public backcountry cabin 11 km from trailhead. Main Access From the junction of Highway 1 and Highway 23 north in Revelstoke, 51.7km north on Highway 23 to Keystone Forest Service Road. Then 16 km to the trailhead. This road is generally suitable for all vehicles but expect narrow, steep and rocky and rutted sections. All junctions are obvious; follow the most travelled route. The trail is moderately easy to 6 km then ranges from moderately difficult to strenuous, and is in a lightly travelled wilderness area; you need to be in good physical condition and be properly equipped with good hiking footwear, rain gear, food and water. Water is available from creeks but should be boiled or treated. This trail is popular among mountain bikers; please respect their activity and give way, especially on downhill sections. There is no cell phone service in this area. Facilities Pit toilet at trailhead. All services in Revelstoke. Other Recreational Activities Mountain biking; heavy winter use by snowmobilers. A network of valley bottom trails near the confluence of the Illecillewaet and Columbia Rivers. Seasons to Visit Year round; birding best in spring and early summer. Some trail sections may be flooded during times of high water. Habitat Grassland, marsh, swamp, riparian. Viewing Highlights Mostly easy trails in the floodplain of the rivers' confluence. Marsh and forest birds, raptors and other wildlife. Scenic views south to Mounts Begbie and MacPherson. Main Access South on Campbell Avenue and Centennial Parkway from downtown Revelstoke; the main parking area is 1.2 km south of the intersection of Campbell Avenue and Victoria Road. Secondary Accesses There is parking at the north end of the bridge on the east side of town where Airport Way crosses the Illecillewaet River. There are several other pedestrian accesses but in residential or industrial areas where parking is limited. Stay out of the Downie Lumber mill area inside the dyke. This section of the Columbia River is downstream of the Revelstoke Dam and is subject to occasional sudden release of water from above the dam; use caution and be alert when near or on the river. Regulations No camping or fires. Dogs on leash. Facilities Picnic tables and flush toilets at Centennial Park. All services in Revelstoke. Other Recreational Activities Cycling, canoeing, kayaking. A boardwalk leading through montane wetlands between the TransCanada Highway and the Illecillewaet River. Seasons to Visit June through October; birding best in spring and early summer. Habitat Interior cedar-hemlock, marsh, swamp, riparian. Viewing Highlights An excellent place to observe marsh and swamp ecosystems, via an accessible boardwalk. Marsh and forest birds; highlights include American Dipper, Northern Waterthrush and American Redstart. Main Access From the junction of Highway 1 and Highway 23 north in Revelstoke, 26.3 km east on Highway 1. National Parks permit is required for all vehicles stopping here. Facilities Picnic tables and flush toilets when open. All services in Revelstoke. Two short boardwalk trails leading through old growth cedar and hemlock forests. Seasons to Visit June through October; boardwalks closed when snowbound. Viewing Highlights Two outstanding preserved sections of large old-growth trees in the Interior wet belt; some are over 500 years old. Giant Cedars trail is a well-maintained wooden boardwalk but has many stairs; the Hemlock Grove boardwalk is completely accessible . Main Access Giant Cedars: from the junction of Highway 1 and Highway 23 north in Revelstoke, 29 km east on Highway 1. Hemlock Grove: 54 km east on Highway 1 from Revelstoke, or 15 km west from Rogers Pass Discovery Centre. National Parks permit is required for all vehicles stopping at these locations. Stay on the boardwalk; three roots and the forest understory are easily damaged by too many feet. Mobile phone service is limited to non-existent in this area. Facilities Picnic tables and flush toilets when open. All services in Revelstoke and Golden. 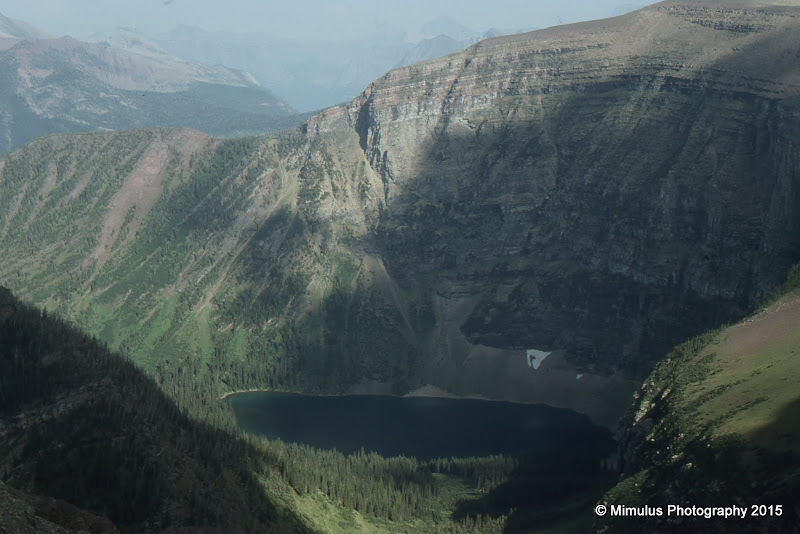 Glacier National Park contains montane, subalpine and alpine areas, with glacial and post-glacial landscapes. In addition to being part of Glacier National Park, Rogers Pass is a National Historic Site. Seasons to Visit Year-round; trails free of snow June through October. Rogers Pass Centre is closed mid-October to mid-November. Habitat Interior cedar-hemlock and Englemann spruce/subalpine fir forests rocky basins and post-glacial landforms, alpine tundra. Viewing Highlights Rogers Pass Discovery Centre has park and travel information, with interpretive displays featuring information on natural areas, wildlife and ecosystems, and on human heritage, particularly regarding explorers, mountaineers, railway history and avalanche control. The centre is designed with an exterior architectural motif resembling an old style railway snowshed. A monument at Rogers Pass proper commemorates railway workers killed by avalanches. The moderately easy Abandoned Rails Trail runs 1.2 km one way between Rogers Pass Discovery Centre and the monument at Rogers Pass . Avalanche Crest Trail is a fairly strenuous trail to a rocky alpine basin where glaciers and post-glacial features can be seen firsthand. Main Access Rogers Pass Centre: from the junction of Highway 1 and Highway 23 north in Revelstoke, 70 km east on Highway 1. Or 78.5 km west from the junction of Highways 1 and 95 in Golden. Avalanche Crest trail: at Illecillewaet campground, 5.7 km west from Rogers Pass Centre then 2 km to trailhead. Avalanche Crest trail is a strenuous hike; you must be in good physical condition, with good hiking boots and clothing appropriate to changeable weather conditions. Avalanches occur regularly in winter and spring; there are frequent road closures due to avalanche control. Winter trail users must be properly equipped and qualified for travel in avalanche terrain. Regulations No camping or fires except in designated campgrounds. Dogs on leash. Facilities Picnic tables and flush toilets when Rogers Pass Centre is open; pit toilets at Avalanche Crest trailhead and at Rogers Pass monument. All services in Revelstoke and Golden. Food, fuel and accommodations are no longer available at Rogers Pass. A walk through montane woods by the Kicking Horse River. Habitat Montane lodgepole pine/Douglas-fir forest, prairie grassland, blowdown area, riparian, marsh. Viewing Highlights An easy walk through montane woods and prairie. Scenic views of mountains from Kicking Horse River. Deer Lodge (Jack Tocher) Warden Cabin is a Federal Heritage Site built in 1904, the first built in the park (closed to public). Leanchoil Marsh is an excellent wetland for birding, located on the south side of the highway on the west side of the Kicking Horse River. Access is difficult; there is no pullout on the highway, and thick forest cuts off the marsh from the road to the Wapta Falls trailhead. You can walk along the shoulder of the highway from the campground but use extreme caution. Main Access At Hoodoo Creek campground; 35 km east on Highway 1 from the junction of Highways 1 and 95 in Golden, or 22.3 km west from the Parks Canada visitor centre in Field. Trailhead access road is across from the campground entrance, 0.5 to 1 km depending on how much of the road is open. National Parks permit is required for all vehicles on this road. The trail beyond the Deer Lodge site is moderately difficult to strenuous and is in a lightly travelled wildland area; you need to be in good physical condition and be properly equipped with good hiking footwear, rain gear, food and water. Water is available from creeks but should be boiled or treated. Facilities None; campground facilities are for registered guests only. Basic services in Field; all services in Golden, 35 km west from here, or Banff, 105 km east. Other Recreational Activities Mountain biking; snowshoeing and cross-country skiing in winter. Other Connections Strenuous overnight hiking trail continues to the Ice River area. A glacier fed lake in a valley surrounded by peaks. Area/ Trail Length 5.2 km trail around lake. Habitat Montane lodgepole pine/Douglas-fir, Interior red-cedar/western hemlock and Englemann spruce/subalpine fir forests, avalanche zones, subalpine meadows, riparian, alluvial and glacial outwash plain. Viewing Highlights Different aspects of the lake present different ecosystems: cedar/hemlock on the cooler and wetter south side of the lake, pine/Douglas-fir on the warm and dry north side, and subalpine spruce-fir on the alluvial fan at the head of the lake. An excellent location to view the results of glaciation and water-caused erosion. Emerald Lake Circuit is a moderately easy trail around the lake with interpretive panels. Natural Bridge, on the access road to Emerald Lake from the TransCanada Highway, is an arch of rock across the Kicking Horse River where the creek has eroded away the rock beneath. The Burgess Shale site high above the lake is world famous for Cambrian marine fossils. They can be visited only on an organised tour involving a strenuous hike; there is an interpretive display at the Visitor Centre in Field. Main Access From the Parks Canada visitor centre in Field, west 1.6 km on Highway 1 to Emerald Lake Road. Then 9 km to the end of the road at the outlet of the lake. This road is paved and good for all vehicles but the parking area can be very busy. National Parks permit is required for all vehicles on this road. Trails other than the lake circuit are moderately difficult to strenuous and are in a lightly travelled wildland area; you need to be in good physical condition and be properly equipped with good hiking footwear, rain gear, food and water. Water is available from creeks but should be boiled or treated. The south end of the trail runs through Emerald Lake Lodge property. Do not disturb the lodge or its guests or employees. Facilities Picnic site and pit toilets. Emerald Lake Lodge (privately operated) provides full service overnight roofed accommodation. There is a gift shop, canoe rentals and small coffee shop open to the public; all other lodge facilities are for guests only.. Basic services in Field; all services in Golden, 55 km west of Field, or Banff, 83 km east. Other Recreational Activities Canoeing; snowshoeing and cross-country skiing in winter. Other Connections A network of strenuous hiking trails radiates from the lake, including connections to Yoho Valley via Yoho Pass trail and to the town of Field via Burgess Pass trail. A large hanging valley featuring rivers, waterfalls, glaciers and meadows. Seasons to Visit June through October; the road is not cleared and is closed the remainder of the year. Habitat Englemann spruce-subalpine fir forest, subalpine meadows, riparian, glacial outwash plains, cirques and rocky basins. Viewing Highlights An excellent location to view the results of glaciation and water-caused erosion. Yoho Valley trail is a moderately strenuous trail across a glacial outwash plain and through subalpine woods to Twin Falls. 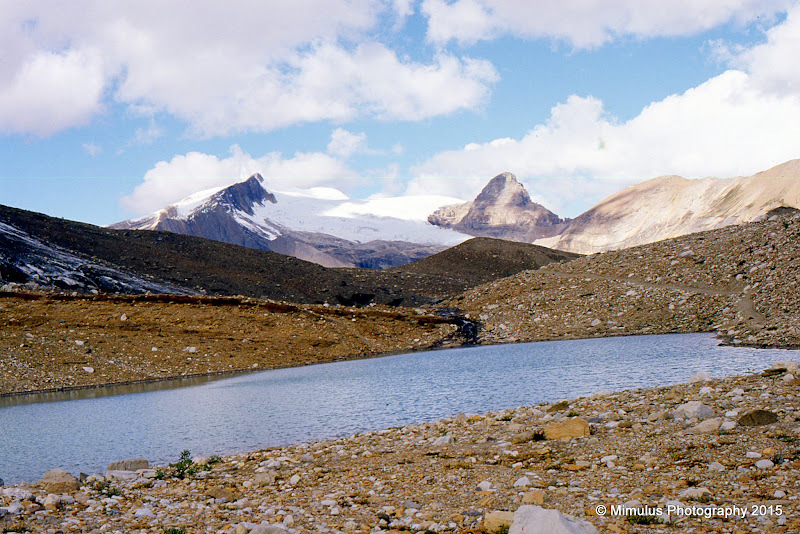 Iceline trail is a strenuous trail featuring direct access to glaciers and post-glacial landforms, with subalpine meadows and spectacular views of the valley and across to Takakkaw Falls. Other long day or overnight trails include routes to Little Yoho Valley, Amiskwi Pass and Bow Glacier. Takakkaw Falls, among the highest in Canada at a total of 384 metres. Easily viewed from the road; a short easy trail leads to the base. Subalpine birds and other wildlife . Main Access From the Parks Canada visitor centre in Field, east 4.3 km on Highway 1 to Yoho Valley Road. Then 13 km to the end of the road at at Takakkaw Falls. This road is paved but parts are steep, narrow and winding with two very tight switchbacks thus not suitable for large vehicles or trailers. National Parks permit is required for all vehicles on this road. Most of these trails range from moderate to strenuous, and are in a lightly travelled wildland area; you need to be in good physical condition and be properly equipped with good hiking footwear, rain gear, food and water. Water is available from creeks but should be boiled or treated. Travel on glaciers is not recommended without proper equipment and training. Please do not disturb guests or employees at the hostel, campgrounds, Twin Falls Chalet or Stanley Mitchell Hut. Facilities Walk-in campground at Takakkaw Falls; vehicle campground at Kicking Horse near south end of road near Highway 1. Picnic tables and pit toilets at Takakkaw Falls. Basic services in Field; all services in Golden, 55 km west of Field, or Banff, 83 km east. Other Recreational Activities Snowshoeing and cross-country skiing in winter; the road is not cleared so you must hike or ski the 13 km from the highway to Takakkaw Falls. A large hanging valley featuring creeks, alpine lakes and meadows, and a significant population of alpine larches . Seasons to Visit June through October depending on snow; ski access in winter. Habitat Englemann spruce-subalpine fir and alpine larch forests, subalpine meadows, riparian, rocky basins, lakes and tarns. Large stands of alpine larch, which are especially brilliant in autumn colours. Several day hiking trails of various levels of difficulty. A major climbing and mountaineering destination. One of the most spectacular and scenic hiking areas in the mountains . Main Access The parking area is 13.2 km east on Highway 1 from the Parks Canada visitor centre in Field, or 9.7 km west from the junction of Highways 1 and 93 west of Lake Louise. 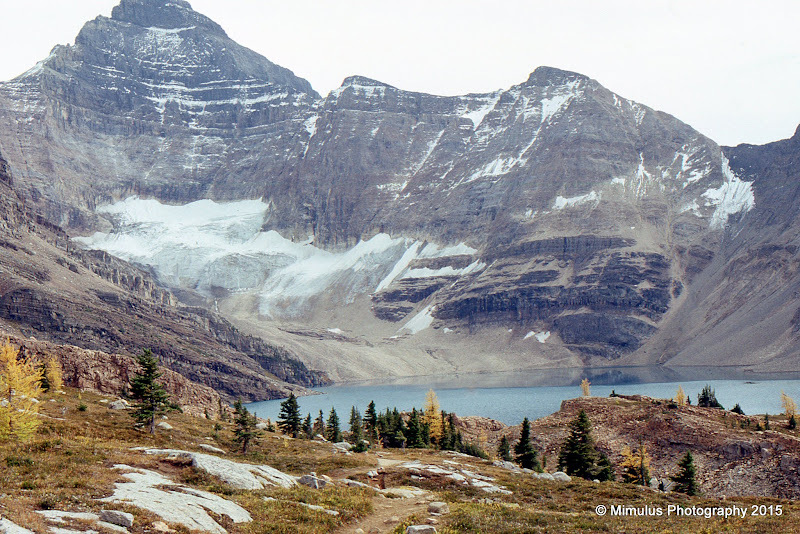 Access to the area is by a one hour bus ride from the parking area to the lake and is strictly controlled; day hikers may be accommodated but priority is given to those with reservations for the campground, the Elizabeth Parker Hut or Lake O’Hara Lodge. Staying overnight at one of these locations is recommended. Alternatively, the moderately strenuous Cataract Brook hiking trail runs 11 km from the parking area to the lake. National Parks permit is required for all vehicles at the parking area. Cautions Be aware of bears and cougars. Some areas are closed during summer months due to grizzly bear activity; these closures are strictly enforced. Most trails here range from moderate easy to strenuous, and are in a lightly travelled wildland area; you need to be in good physical condition and be properly equipped with good hiking footwear, rain gear, food and water. Water is available from creeks and lakes but should be boiled or treated. Travel on the route from Lake Oesa to Abbott Pass or on glaciers is not recommended without proper equipment and training. Please do not disturb guests or employees of the lodge or the alpine hut. Regulations No camping or fires except in designated sites. No dogs or cycling. Facilities Walk-in campground near north end of lake; reservations essential and can be made three months in advance. Lake O’Hara Lodge (privately operated) provides higher end accommodation on the shore of the lake; backcountry overnight accommodation can also be reserved at Elizabeth Parker Hut (Alpine Club of Canada), 0.7 km hike from the road. Le Relais shelter operated by Lake O’Hara Trails Club provides beverages and some refreshments. Some services may also be available at Lake O’Hara Lodge. Picnic tables and pit toilets at Le Relais. Basic services in Field and Lake Louise; all services in Golden, 70 km west, or Banff, 59 km east. Note that this is a backcountry area so you need to be fully prepared and supplied before coming into the area.